Specialising in bulk haulage, muck shifting and plant hire, Ward & Ward provides efficient, reliable and value-for-money services to an ever-growing customer-base in the Mid-West and beyond. The family-run business has the expertise and experience in haulage and logistics to get the job done right every time. The company was set up in Birdhill, a village located on the Tipperary-Limerick border and just a short drive from Limerick city, in 1933 by Danny Ward. Danny, who passed away in 2002, handed the business down to his sons John, Jim and Donal. They have since been joined by John’s son Shane and Donal’s sons Ian and Martin. And not forgetting John’s wife Joan, who looks after the administration. 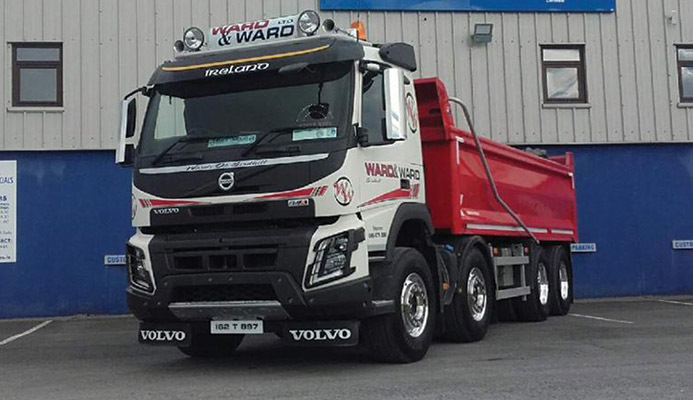 Ward & Ward boasts a modern fleet of 10 tipper trucks and two articulated lorries as well as track machines ranging from 14 to 50 tonnes, a selection of loading shovels, three road sweepers and a new 70-tonne Caterpillar excavator. Through continuous investment in equipment and staff training, the company leads the way in standards of service and competitiveness to its existing and future customers. “We are one of the leading bulk haulage and muck shifting specialists in the region,” Shane proudly states. Ward & Ward’s biggest and oldest client is the Shannon Foynes Port Company which services six dedicated facilities on the Shannon Estuary that are fully ISPS compliant. The ports are strategically located adjacent to national road routes, national rail network, two international airports and the second, third and fourth largest cities in the country. Foynes is the main deep-water facility catering for all key cargo classifications and with a substantial land bank and large storage facilities. Limerick Docks occupies a city centre location some 100km inland from the mouth of the estuary, at the heart of the thriving Mid-West region. There are four dedicated terminals: Shannon Airport with its aviation fuels terminal, Moneypoint and its modern coal transhipment facility, Tarbert Island for heavy fuel and Aughinish catering for bauxite and alumina imports and exports. “We’ve been working for Shannon Foynes Port Company for 40 years. We are in and out of Foynes port and Limerick Docks on a daily basis. Some of our loading shovels have never left either location,” Shane continues. Ward & Ward has come a long way in 50 years as Shane explains: “My grandfather started out with a loading shovel and a lorry. The company has obviously grown quite a bit since then. My father and uncles have always worked well together with John running the fleet, Jim looking after the maintenance and Donal taking care of the plant and machinery. Shane concludes by thanking the haulier’s loyal customers for their continued support.